I'm going to post a full report from Basara Matsuri shortly, as well as reports on a few other excursions I've made. While I'm preparing all of that, this post will serve as a quick summary of everything else that's been announced in the Sengoku Basara fandom over the last two weeks. There's a surprisingly large amount of news when I don't keep up with it on a daily basis. 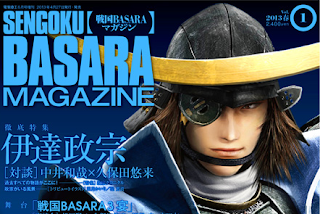 By far the most important news in months; on Saturday 30th March 2013, KobaP took to the stage at Basara Matsuri and revealed the preview trailer for the brand new Sengoku Basara 4. There's not much else known beyond the fact that it's only coming out for PS3 this time around, and that it is going to expand the series earlier in time back to the Muromachi period. The official website opened today, two days after the initial announcement. 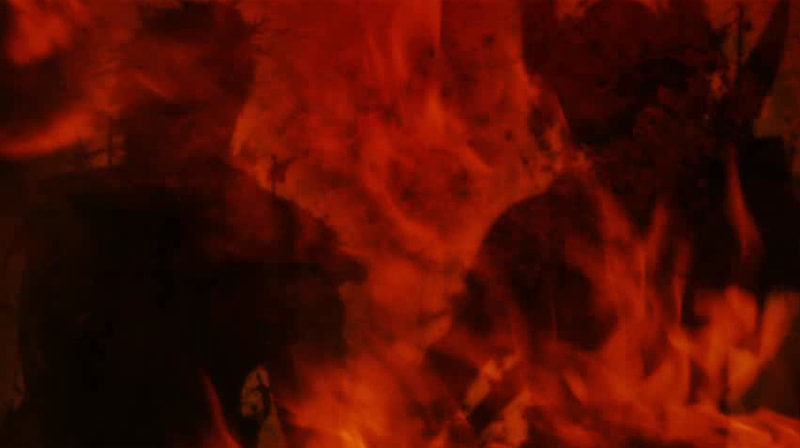 Speculation has been rampant on the identities of the two new(?) characters whose silhouettes appear at the end of the teaser video. 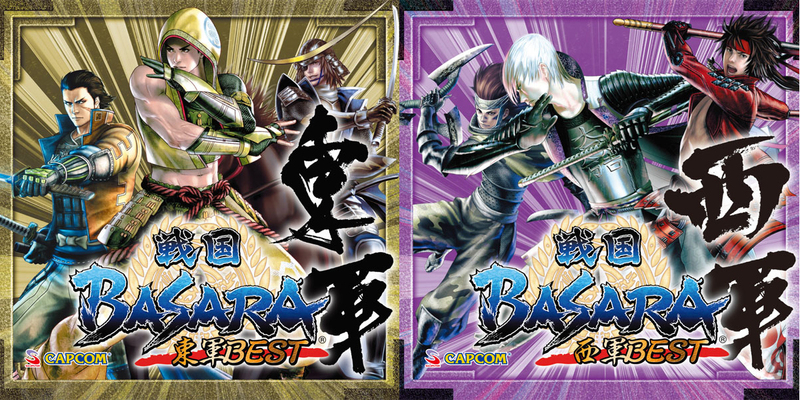 The game isn't coming out until 2014 and it's unlikely that we'll get any more solid hints from Capcom until the summer, unless they sneak some clues into next month's Sengoku Basara Magazine. I mentioned the news on this the other day in a pair of mini-updates, but the website has now gone live and confirmed the various announcements from Basara Matsuri and Dengeki Maoh. The website showcases the cover art and features which will appear in the first issue of the ¥2,400 quarterly magazine on 27th April 2013. The first issue is all about Date Masamune, featuring his seiyuu Nakai Kazuya and stage play actor Kubota Yuuki. It will include a Masamune rubber strap (in the Mame Sengoku Basara style) and a Shougeki Basara Talk! CD presented by Nakai Kazuya and Morikawa Toshiyuki (Katakura Kojuurou). Actors Matsuda Kenji, Kubota Yuuki, Hosogai Kei and Yoshida Tomokazu will feature in an article about the upcoming Butai Sengoku Basara 3 Utage stage play. 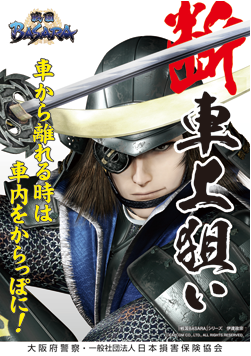 The magazine will also include two chapters of manga; one of which will be Sumeragi's ongoing Mame Sengoku Basara series while the other will be Satta Naoto's brand new manga based on the BSR48 drama CD 'Soul Revolution'. There will be additional tribute illustrations by Shimotsuki Kairi and Tsutsumi Yoshisada. The crown jewel of the first issue, however, is going to be an exclusive interview with series producer Kobayashi (KobaP) and director Yamamoto on the topic of Sengoku Basara 4. That interview should include some new tidbits of information; there's no way they can mumble their way through a complete article without letting something slip. The first preview images were released for the first ever Sengoku Basara musical, which is being performed by the renowned Takarazuka troupe's Hanagumi from 15th June 2013 until 1st July 2013. The musical will be titled Sengoku Basara -Sanada Yukimura Hen- and the three main characters will be Sanada Yukimura (Ranju Tomu), Uesugi Kenshin (Asumi Rio) and a brand new female character called Inori (Ranno Hana), who is said to be Yukimura's childhood friend. As it's a musical, the cast will be performing vocal versions of the songs from the series. They've also reimagined the costumes to be more glamorous and suitable for an all-female acting troupe. A preview video was played at Basara Matsuri which showed the cast singing one of the songs from the new play; I cannot find it online to include in this post and the other news from Basara Matsuri has saturated most gaming news websites. I'm sure it will turn up very soon. The release date for the Tougun BEST and Seigun BEST compilation CDs has at last been confirmed as the 24th April 2013. They'll be priced at ¥2,100 each and contain a selection of popular tracks from the history of the series as well as some music which hasn't appeared on CD before. The cover art for both editions was also revealed; it's nice to see some of the less common artwork appearing outside of the mobile games. The first ever Butai Sengoku Basara Busho Matsuri 2013 will be held on the 13th and 14th July 2013 at Tokyo's Ariake Coliseum. This event is unlikely to include any news about the games; instead it's entirely focused on the stage play series, bringing old and new actors together for the first time. The amazing list of guests includes Kubota Yuuki, Hosogai Kei, Hirose Yuusuke, Nakamura Seijirou, Yoshida Tomokazu, Murata Youjirou, Sakimoto Hiromi, Odai Ryouhei, Nakamura Kazuto, AKIRA, Chinen Sayaka, Masao, Beppu Ayumi, Shirakawa Yuujirou, Kotani Yoshikazu, Nitta Kenta, Katou Yasuhisa, Asakura Yuuta, Kawamura Yukie, Yashiro Minase, Taniguchi Masashi, Imai Yasuhiko, Takahashi Hikaru, Tsukamoto Takuya, Sakurada Kousei, Kubodera Akira and Tamaki Nami. That's the vast majority of all of the actors who have worked on the stage play to date and it's possible that the remaining few will be announced later on. I can't wait to hear the reports about what the Busho Matsuri involves. The wackiest news from Basara Matsuri was that Capcom's Date Masamune has been selected as the image character for a police campaign in Osaka to reduce vehicle crime. He's not exactly a safe driver himself in the series, but the police are hoping that he'll get people interested in obeying the law. While it's not the silliest tie-in that the series has had, it's definitely up there in the list. I'd like to see the posters on display around Osaka one day! Players of the upcoming PC/Xbox Capcom game Monster Hunter Frontier G can look forward to a collaboration which allows them to obtain costumes resembling the Sengoku Basara versions of Masamune and Yukimura. The reaction on Twitter from most Japanese Sengoku Basara fans was simply "What's Monster Hunter Frontier G?". I'll keep this one short as I don't think anyone is interested. 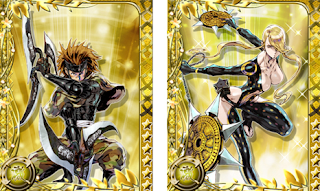 Capcom's popular illustrator Nishimura Kinu has created some new cards featuring Kasuga and Sarutobi Sasuke for the browser game Sengoku Basara Card Heroes Matsuri. 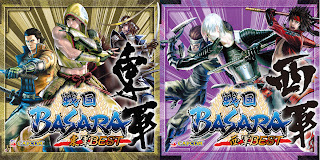 They're available from now on, and to celebrate Basara Matsuri there are two other special cards that can be collected in-game until 10th April 2013: Toyotomi Hideyoshi and Maeda Keiji. 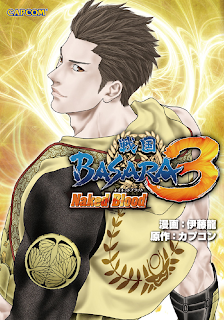 The cover art and release details for Sengoku Basara 3 Naked Blood finally appeared during my holiday. Itou Ryuu's serialised tale of Tokugawa Ieyasu's life from Capbon magazine is being collected into a single 208-page manga volume for release on 8th April 2013 costing ¥630. Naked Blood is the companion to Itou's longer Bloody Angel series about Mitsunari. In addition to the Naked Blood news, the Dategun Chronicle anthology came out last week so I can confirm the full list of contributing artists. As well as the previously-mentioned Sasakura Kou and Arai Karo, there's manga from S. Kosugi, Ameno Rona, Tane Jugou, Kuromura Moto, Kyunkichi, Tanso, Taki Hiromi, Yamamoto Akko, Tachibana Akira, Kurubushi, Kohtake Hiroyoshi and Hakyu Shou. Sazanami Ichiya and Tsutsumi Yoshisada provide colour illustrations and Ashika Nozomu drew the cover art. Although the anthology is about the Date forces I was pleasantly surprised to see how many other characters crept into the short stories as well.